The upcoming Spring season marks the start of our 2018 year at ballhockey.com, and with that we are excited to announce a few changes to our rules in an effort to better your game experience. Beginning this Spring season, we will be adding an additional 2 minutes of play time to every game. 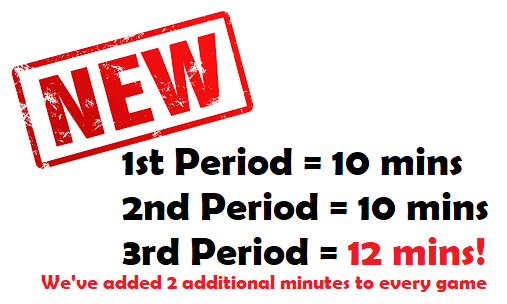 Our new format with see our period structure change to 10-10-12, with the 3rd and final period now being 12 minutes in length. The addition of two minutes per game over the guaranteed 14 game season will provide all players an additional game of playing time. We are also excited to introduce one more rule change surrounding our icing rule by introducing hybrid icing. You've seen this introduced in the NHL with success and now it is coming to Ballhockey.com. So how does hybrid icing work? #1. The official must determine that the ball will cross the goal line. #2. If the attacking team player will get to the ball first, as determined by which player reaches the end zone face-off dot first, then icing shall be waved off and play continues. If the defending player reaches the end zone face-off dot first OR if the race is too close to determine at that time, icing shall still be called. The move to hybrid icing will add an additional element to the game that will allow for a more open game on our smaller-sized rinks, while still eliminating concerns for player safety that exist with touch icing.